We did a 10-day tour with VHS Or Beta last year, and now we’re using all the footage we collected to bring you with us. For the next three weeks, we’ll be showing two videos a week, each documenting a different night of the tour. We kicked off the tour in Newport, Kentucky at the historic Thompson House. While it may be a new year now, we still snuck a couple of best of 2012 lists in under the radar on Monday. Catch up with the best books of 2012, the best graphic novels of 2012, and the best mainstream comics of 2012. Once the clock did turn, we committed to starting 2013 off right by sharing our pop-culture resolutions. Looks like a lot of us are going to write books this year. We also looked forward to all the beautiful pop-culture treats coming our way in 2013 with our Inventory of the 63 most anticipated entertainments of the coming year. To keep ourselves from getting too excited, we looked back on our most anticipated entertainments of 2012 to see how they stood up to our expectations. A few days later we realized how well our own New Year’s celebrations went by seeing the most disastrous New Year’s Eve broadcast of all time. We shared our holiday gifting strategy with our annual Year In Swag. Please don’t tell our relatives where we got their presents. 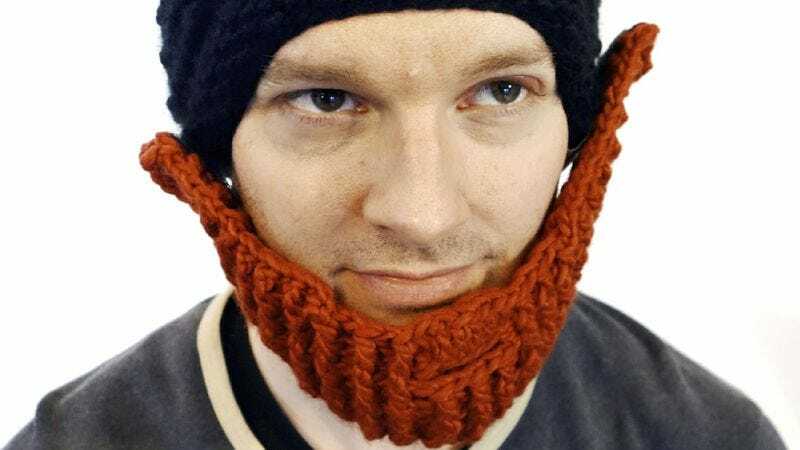 We knew that beard hat would be perfect for someone. Get more of Adventure Time creator Pendleton Ward’s oddball sense of humor with his poignant webseries about outer-space nonsense. Jason Heller and John Semley collected the month’s top noisemakers into a new Loud column. “But before Kiss And Make-Up presents [Gene] Simmons the horrible, horrible man, it asks us to feel a little for Simmons the overwhelmed little boy.” That beautiful quote is one of many reasons Nathan Rabin is reviewing every Kiss memoir in Silly Little Show-Biz Book Club. We spent the week looking at realistic horror films to honor Texas Chainsaw 3D, including Night Of The Living Dead’s indiscriminate killing spree. With more than 10 years of beats and records, we’ve created a guide to the music of Kanye West. Want to catch up with an entire year of The A.V. Club? Of course. We made it easy by picking our favorite articles of 2012. Once that’s done, catch up with the best of our sister site, The Gameological Society, had to offer this year. Prepping for the glorious return of television? These 10 episodes of Cougar Town will ready you for its January 8 return. And if you already love the show, they’ll remind you why. In Money Matters, Nathan Rabin talks to J-Zone about how he lost his interest in rapping and learned to embrace failure. As long as there is a best of TV list, our readers will fight about it. And our worst of TV list. And best of film. Pretty much all of our year-end content. That’s okay though, it takes the heat off of this week’s articles. See: We’d recommend 56 Up—the latest film in the Seven Up documentary project—even if it weren’t one of two films to come out this week. We’ll also recommend Texas Chainsaw 3D much more than we expected to, but it’s still a C+. Miss out on Django Unchained and Les Misérables last week? Still go see them, but also watch Django as a sitcom and two parents lose it after seeing Les Misérables first. Read: Two interesting but flawed books squeaked in right under the wire of 2012. The first was Warren Ellis’ Gun Machine, another pulp novel from the cult comics icon. The second, and slightly worse, was Philip Pullman’s Fairy Tales From The Brothers Grimm, a retelling of the stories through the lens of the man who brought children the His Dark Materials trilogy. If neither of those sound too appealing, there’s always that best of books list. Watch: American Horror Story had the hand’s down greatest scene ever to make it to television, so watch that right now. Once it’s done and the wonder has left, might we suggest The Hour? Or, in what may be the last time we recommend watching it, The Big Bang Theory, which had an A episode this week, despite the apoplectic Internet complaints that this is not possible. We promise it’s not as bad as MTV’s new Jersey Shore replacement, Buckwild.